This is a backstage shot of members in the cast of Heath Hyche's Halloween Havoc at the Comedy & Magic Club in Hermosa Beach CA in 2005. 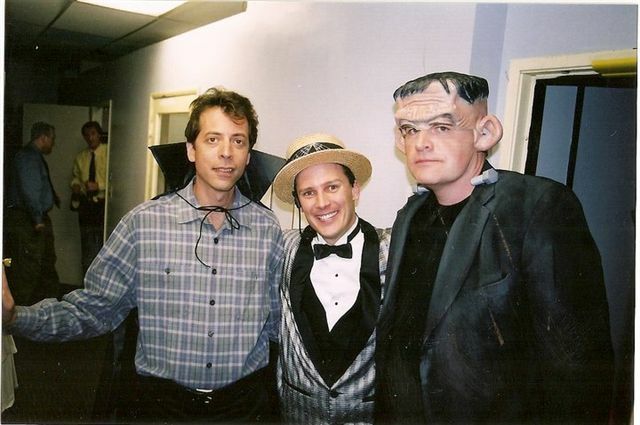 Fred Stoller is on the left and you may know him from playing Ray's cousin Gerard on "Everybody Loves Raymond". He also has a new DVD coming out soon called "Fred and Vinnie" being released on NetFlix soon. Center is my buddy Heath who is currently performing on a Disney Cruise near you and a cast member of the "Blue Collar TV" sketch comedy series (also on DVD). On the right is yours truly as Frankie and I am currently watching a DVD!! !